Gene Brandi raises thousands of honeybees in California’s Central Valley, the agricultural engine for much of the nation’s produce. Each February and March, his bees are among the 1.7 million rented colonies that swarm over the valley’s 850,000 acres of almond trees. They descend on the riot of pink blossoms, collecting pollen to provision their nests. In the process, they cross-pollinate the trees, enabling these farmers to grow 80 percent of the world’s almonds. As autumn wanes, some hives naturally go silent, empty, dying back in the chilling air and fading light. When Brandi launched his business in the 1970s, he rarely lost even 5 percent of his bees over the winter. But that changed a decade ago when colony collapse disorder arrived on the scene. One year, he lost almost half. Now he’s averaging 30 percent. It’s not just a California problem. Across the country and the world, many pollinators are in decline or at risk of extinction. It’s a serious issue because forests, prairies, meadows, wetlands, seashores and croplands all depend on a diverse and healthy pollinator community to thrive. Globally, nearly 85 percent of all flowering plants require help from animals to produce seeds and fruit. Without them, neither humans nor wildlife would have as much to eat and as a result the planet’s biodiversity would plummet. Although hummingbirds, songbirds, bats, possums, monkeys, mice and other vertebrates spread pollen, insects do the heavy lifting—both in the wild and on farms. The key players: wasps, beetles, flies, moths, butterflies and, especially, bees. U.S. agriculture depends heavily on managed European honeybees, and to a lesser degree, cultivated native bumblebees and leaf-cutting bees. Colonies are trucked from farm to farm like migrant workers. They service about 100 commercial crops, from fruits, nuts, vegetables and oilseed to fiber, biofuel and the alfalfa we feed to livestock. “Pollinators contribute more than $24 billion to the United States economy, of which honeybees account for more than $15 billion,” says Nancy Gloman, Defenders’ vice president of field conservation. “Some crops, such as almonds, are almost exclusively pollinated by honeybees.” Fifty-plus native bee species, visit California’s watermelon, sunflower and tomato crops and more than 80 species pollinate berries in Maine and Massachusetts. “There’s a widely stated phrase in agriculture that you can thank a pollinator for one out of three bites of food you eat,” says Claire Kremen, a researcher at University of California-Berkeley. But when colony collapse disorder hit in 2006, U.S. honeybee keepers suddenly began losing 30 percent to 90 percent of their hives. In this “rapture of the bees,” worker bees mysteriously disappeared, leaving behind only the queen. During the winter of 2012-2013, U.S. beekeepers lost 45 percent of their hives. In testimony before a U.S. House Agriculture subcommittee, farmers estimated that the honeybee crisis could cause up to a 10-fold increase in food prices. Scientists say that the phenomenon is caused by a deadly confluence of factors: poisoning from pesticides, disease, parasites, disappearing habitat and subsequent malnutrition, and climate change. Many studies implicate a class of pesticides called neonicotinoids. These nicotine-like chemicals treat more than 140 million acres of U.S. corn, wheat, soy and cotton plants—and are used in home gardening products. They absorb into a plant’s vascular system, contaminating leaves, flowers and the pollen and nectar that bees gather. Highly toxic in minute quantities, “neonics” attack insects’ central nervous system, paralyzing and eventually killing them. By volume, neonics are 10,000 times as toxic as DDT. But the death toll isn’t the only story, says Zac Browning, a fourth-generation beekeeper in North Dakota. Though he loses far fewer bees than the national average, he says his colonies suffer from sublethal “failure to thrive” effects. The bees are weak, lethargic and don’t digest food properly, rendering them useless for pollination. When Bayer Cropscience launched imidacloprid—the first neonic compound—in 1991, the company stated that it was safe for “nontargeted” species. But growing data now substantiates the collateral damage that Browning observes on the prairie every day. A recent British study observed “massive” effects on bumblebees: They couldn’t gather enough food for their hives to produce new queens. French researchers found that low doses caused neurotoxic symptoms, impairing bees’ navigational and homing abilities. The most damning evidence came last June when an international task force published an analysis of 800 peer-reviewed studies on neonics. They found broad evidence of harm to nontarget creatures, not just bees, but also birds, wasps, butterflies, lacewings, beetles, earthworms, fish and other creatures. Neonics impaired insects’ ability to reproduce, forage, learn and remember. They also killed the young, caused birth defects and shortened lifespans. Six neonics are now marketed in hundreds of products that are used to treat seeds and spray crops and ornamental plants. “They are highly toxic and highly persistent,” says Scott Black of the Xerces Society for Invertebrate Conservation. He notes that they can remain in soil for years after a single application—and wash into waterways in high concentrations. A Dutch study found that 70 percent fewer invertebrate species lived in water polluted with imidacloprid. And killing off mayflies and midges could have a domino effect on birds that rely on flying insects for food. Neonics have become a pesticide of choice, with crop use skyrocketing from under 500,000 pounds in 2003 to more than 3.5 million pounds in 2011, according to EPA estimates. “Whole regions that didn’t use neonics are now blanketed,” Black says. And few farms use just one agrochemical. Bee-collected pollen usually contains residues from multiple pesticides, which have never been tested in combination. In 2013, the European Union instituted a two-year ban on three neonics. Last November, the Ontario government announced an 80 percent phase-out of neonic-coated seeds by 2017. But the United States is still far from taking action, prompting Defenders to go to court to protect bees and native pollinators from the harmful affects of neonics in January 2014. 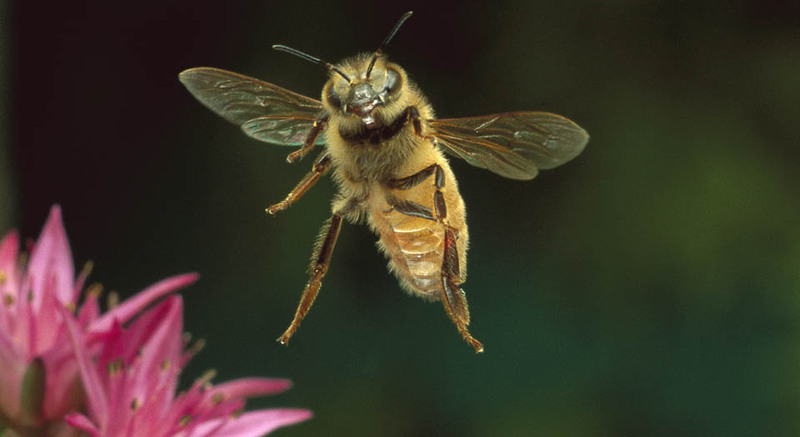 “Defenders has recognized bees as a key species, and substantial evidence suggests that neonicotinides and next-generation pesticides like sulfoxaflor are playing a major role in the decline of these critical species,” says Jason Rylander, Defenders’ senior staff attorney. Meanwhile, a handful of cities have banned their use on city-owned land and five states are considering stronger regulations. Next year, the U.S. 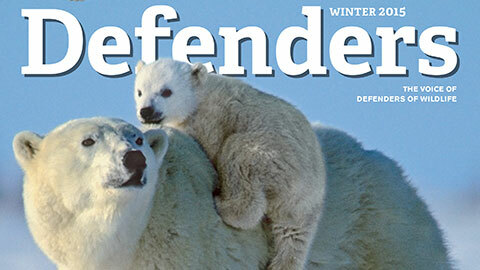 Fish and Wildlife Service (FWS) will curtail use within federal wildlife refuges. There is ongoing debate over whether these chemicals can be safely used. Improper application has obvious effects, like a recent “bee-pocalypse” in Oregon where at least 50,000 bumblebees dropped dead after linden trees were sprayed with the neonic dinotefuran to control aphids. But pesticides aren’t the only villains. The deadly Varroa genus of mites and the tracheal mites that invaded the country in the 1980s slip between bees’ abdominal segments to feed on body fluids and lay their eggs among developing bee larvae, killing them. Mites also carry devastating viruses that are becoming more prevalent. Insecticide exposure compromises immunity, making bees more susceptible to infection. One of these, deformed wing virus, leaves bumblebees and honeybees with stubby, useless wings, altered abdomens and paralyzed limbs. Commercially raised bumblebees have also transmitted pathogens to their wild counterparts. In combination with other threats, it’s pushed Franklin’s bumblebee to near extinction, along with about a quarter of the 50 bumblebee species. Fighting both infection and infestation is getting harder. Some diseases are now antibiotic-resistant, and Gene Brandi says that most beekeepers use up to four products to fight against mites, with marginal results. Healthy diet can help buffer against disease, but as wild lands and diverse native vegetation are replaced by roadways, manicured lawns, crops and non-native gardens, “pollinators lose the high-quality food and nesting sites that are necessary for their survival,” says Christina Meister, a U.S. Fish and Wildlife Service expert. Little area remains for foraging—or for migratory feeding for mobile species such as bats, butterflies, songbirds and hummingbirds. And with milkweed disappearing from the landscape—the only plant monarchs lay their eggs on—their numbers have reached record lows. “We lose 6,000 acres of habitat a day in the United States,” says Black. Until recently, the upper Midwest held some of the last, best bee landscapes. That was partly because of the Conservation Reserve Program, a Farm Security Administration initiative that helped preserve about 40 million acres. “It gave us this incredible buffer from agriculture and gave our bees food to eat,” says Browning, which is why his operations are centered in North Dakota. Climate change is also a factor in pollinator declines, with shifting temperature and precipitation patterns altering the distribution of plants and their flowering times. In the drought-stricken West, there is little nutrition available across the parched terrain. Browning is deeply concerned about the future of farming and food production. “What we’re doing out in the landscape is not healthy for pollinators or wildlife,” he says. Pollinators are keystone species that entire ecosystems depend on. They provide the fruits and seeds that nourish about 25 percent of all birds and mammals. “If you care about wolves, grizzly bears, songbirds—you need to care about pollinators,” says Vicki Wojcik of the Pollinator Partnership. To address the crisis, President Obama issued a Presidential Memorandum last June, convening a new task force to develop a National Pollinator Health Strategy that assesses the effects of pesticides, increases forage on federal lands, and educates the public. Also needed: better tools to fight the Varroa mite, cooperation from farmers to use pesticides in ways that have less impact, and better EPA oversight on agrochemicals. Black is cautiously optimistic. The federal effort is creating momentum, he says, with conservation groups working with farmers to restore habitat. The quest to restore land for pollinators is also creating unlikely allies. For example, a pheasant-hunting organization called Pheasants Forever has helped preserve 1 million acres in the Midwest for these birds—and bees. Others are urging municipalities to limit mowing and allow native plants to regrow along railroad tracks, roads and utility lines. Capped landfills and mine reclamation areas are now being considered in pollinator restoration efforts. Individuals can make a difference, too. In backyards, outside classrooms and office buildings, everyone can plant native wildflowers that bloom throughout the season—without using pesticides. Today fewer than 5,000 survive in seven scattered populations in southwestern Colorado and southeastern Utah. But things are starting to look up.